ESCONDIDO — Calling all pet parents and fur baby lovers: Rebecca Reeb, an Escondido pet artist, is ready to paint your dog’s (or cat’s) portrait for the upcoming holiday season and beyond. Once the portrait is completed — it takes her between 10 and 30 hours depending on the dog’s size — she gives back a portion of the proceeds to the client’s chosen animal charity. 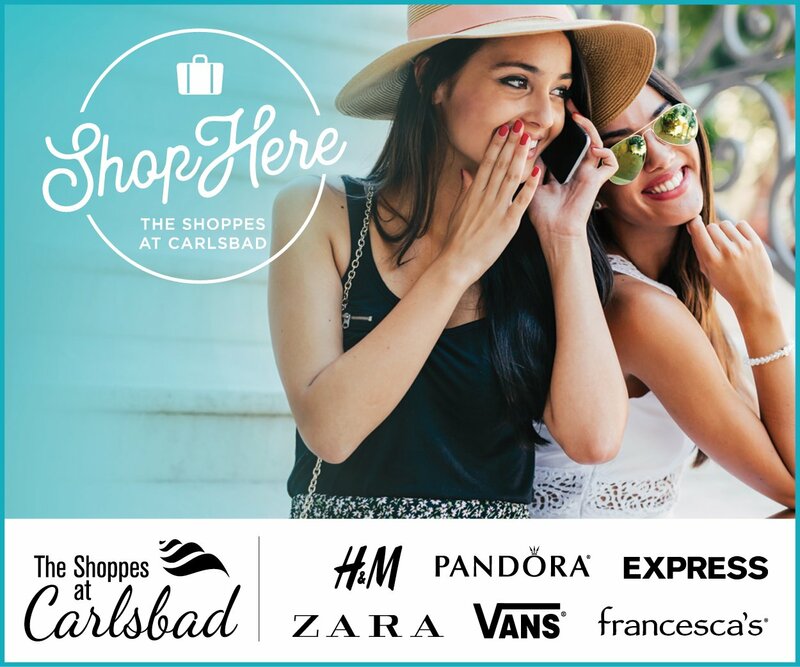 Recently, Reeb has teamed up with San Diego Humane Society to donate up to 30 percent per painting back to the shelter. Caring for animals is nothing new for Reeb, who said she has always been an animal lover and an advocate. 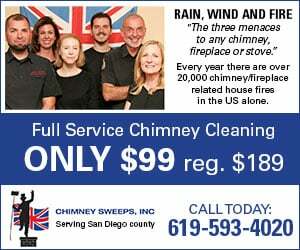 For example, for many years she has been a paid employee as well as done volunteer work for Animal Friends of the Valley in Temecula, Escondido Humane Society, San Diego Humane Society and the San Diego Zoo Safari Park. She also served as the AniMeals coordinator at Helen Woodward Animal Shelter, a program that provides pet food to seniors and others who need assistance. 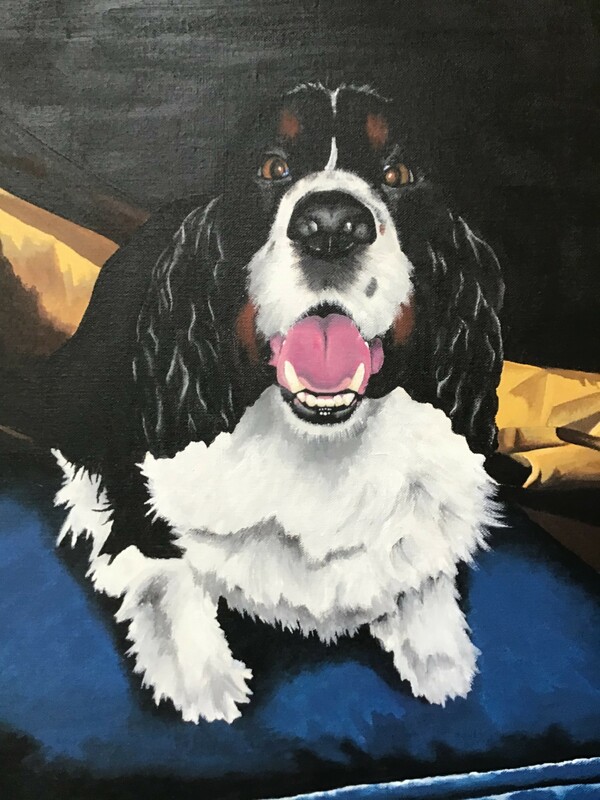 Additionally, for the Humane Society’s recent Fur Ball gala, Reeb created paintings of honoree Colleen Blackmore Reilly’s dogs, and Star of the Ball, Olive. She also donated an opportunity for an original painting, which raised $630 for the shelter. While she is good at what she does, Reeb has had no formal art training, but all her life people have described her as creative. She graduated from Point Loma High School where she was made her first $50 as an artist for painting an elephant. She later went on and graduated from a liberal arts college in Pennsylvania. Reeb said she has tried and enjoyed just about every craft there is but “decided to focus on her favorite, which is painting.” Her paintings include landscapes, pastorals, fanciful wine labels, and of course, pet portraits. “I’ve dabbled in watercolors a little over the past 20 years, but I just started painting about eight years ago,” she said. “My husband, Marc Weinberger, is a full-time civil engineer, but grows grapes and makes wine as a hobby. We wanted some fun labels for the bottles, so I gave it a go. It looks like her talent has paid off, Reeb won the Silver Medal in Wine Maker Magazine’s 2014 Label Contest for her original work “Fruit Bomb” featuring dogs Greta and Sobe. She also received a special write-up in Wine Maker Magazine in 2013 for her “Chateau Woof ‘du Paw” label with German Shepherd dog, Baron, as the Pope. Always the animal lover and rescuer, if Reeb sees a stray dog while she’s in the car, she’ll stop and do whatever it takes to get the dog safe and hopefully home. Her license plate is DOGMAMA, she said. In the end, Reeb said she’s just trying to spread the joy through her colorful paintings of all those fur babies. Paintings range from $200 to $600 depending on size and number of pets per portrait. From that fee she donates between $50 and $150 back to the animal charity of choice, which works out to 25 to 30 percent per work. 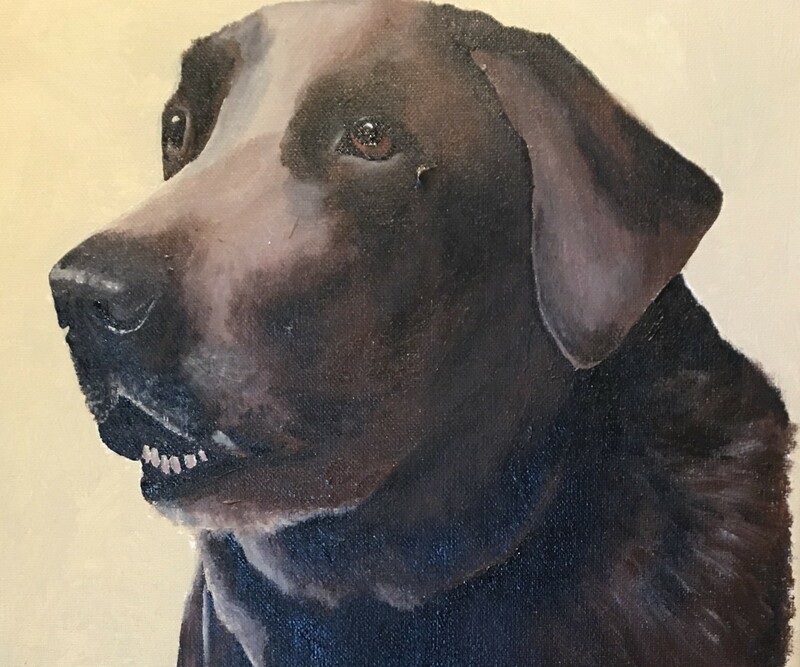 For more information, or to have your dog painted, visit Reeb’s website at www.originalpetpaintings.com or people can call Reeb at (619) 994-6559. Reeb said if you want a holiday portrait delivered on time, be sure to contact her as soon possible.